Heading to the beach this summer? 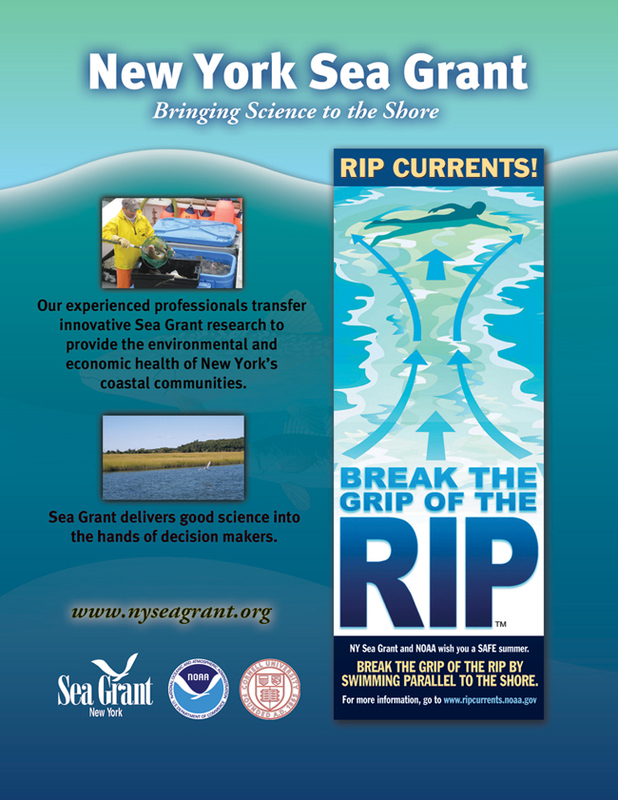 NOAA and Sea Grant are urging beachgoers to learn how to “Break the Grip” of rip currents before getting into the water. Rip currents are a potentially deadly threat -- accounting for more than 80 percent of lifeguard beach rescues. 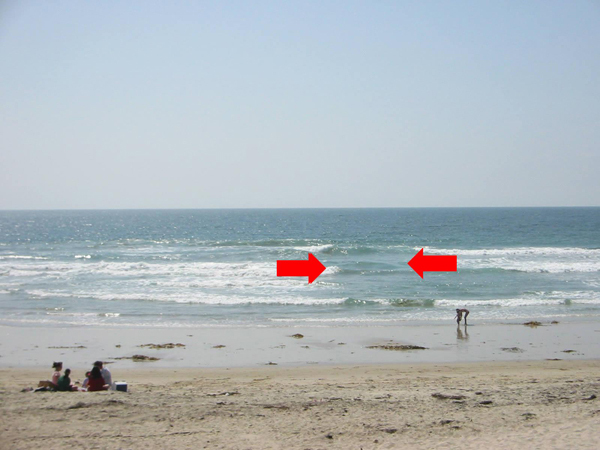 Rip currents are narrow channels of fast-moving water that pull swimmers away from the shore. They can occur at any of New York’s many beaches with breaking waves--from the ocean beaches of Coney Island or Jones Beach to the eastern shore of Lake Ontario. Moving at speeds of up to eight feet per second, rip currents can move faster than an Olympic swimmer and can easily overpower a victim. Panicked swimmers often fail trying to counter the current by swimming straight back to shore — putting themselves at risk of drowning because of fatigue. "Rip currents can be killers. The United States Lifesaving Association estimates that the annual number of deaths due to rip currents on our nation's beaches exceeds 100,” says Peter Davis, president of the Gulf Coast Region of the United States Lifesaving Association and chief of the Galveston Island Beach Patrol. Speak to on-duty lifeguards about rip currents and other expected water hazards. Many coastal National Weather Service offices issue Surf Zone Forecasts providing a three-tiered structure of low, moderate and high to describe the rip current risk. All National Weather Service offices forecasting a moderate to high risk of rip currents include this information their Hazardous Weather Outlook. These forecast products are available online at www.weather.gov. 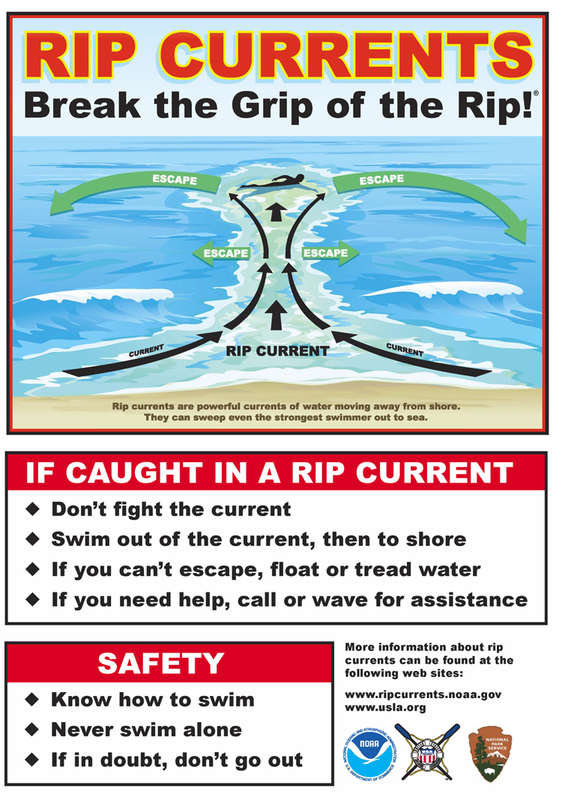 More safety tips and educational materials can be downloaded at http://www.ripcurrents.noaa.gov. Heading to the beach this summer? When going in for a swim, be alert to the signs of rip currents. The National Oceanic and Atmospheric Administration (NOAA) and the National Sea Grant College Program remind you not to get dragged out to sea. Pictured between the red arrows is a rip current, as seen from the beachgoer's perspective. Beach warning flags come in a variety of colors, some of which are blank while others have symbols. The red, yellow, orange and green flags are warnings about the currents or surf. 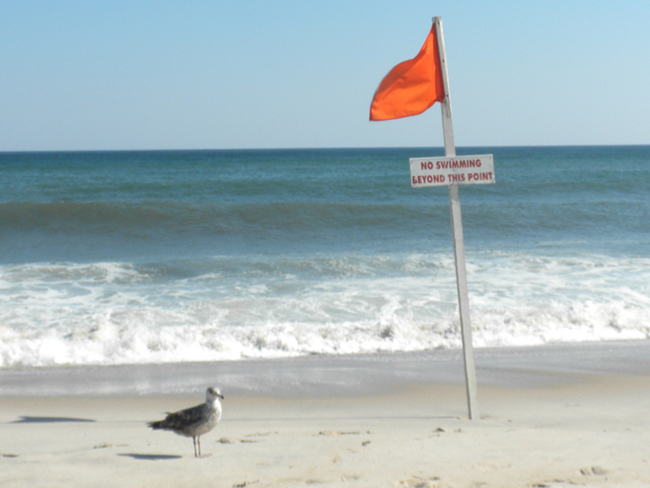 One or two red flags or a black flag means "high surf and no swimming," while green means "calm waters." Yellow signs report light surf or currents and advise caution. 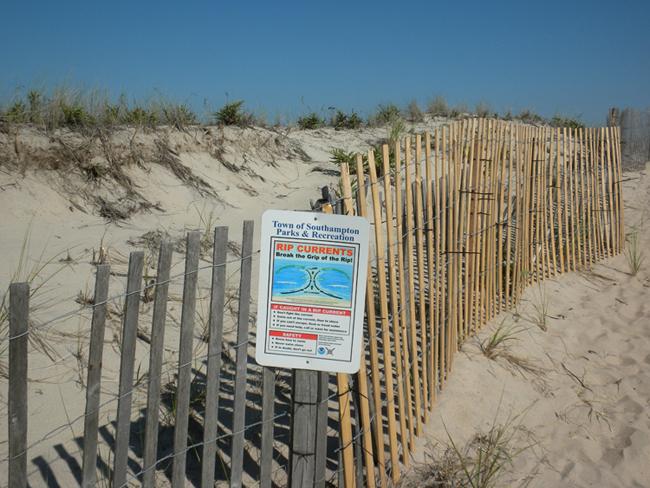 Signs like this one at Ponquogue Beach in Hampton Bays, NY educate beach goers how to break the grip of a rip current if caught in one while swimming. Features include: A rip current overview; Links to real life rip current stories, media and educational tools including multimedia, beach safety tips, local weather and surf forecasts, cool photos, games and a glossary. Also available on the site are links to download full color brochures and signs in English and Spanish on rip current safety. And new for 2011, a kids page, medical concerns, and 28 widgets offering lifesaving messages and safety tips. Look for the "Whistle For Life" with the Break The Grip of The Rip graphic. They'll be distributed by local coastal weather forecast offices and by lifeguards.